Home » Personnel » Working conditions » Working with computers » How do I recognise complaints or symptoms in myself? tingling sensations in the lower arms. If the aforesaid symptoms keep recurring then seek advice from the occupational physician or your general practitioner. You can make an appointment with the occupational physician without prior permission. Ask your health & safety coordinator for the contact details. More information on Ilness and Disability can be found here. The symptoms no longer disappear when you relax and you can also experience these during the night. At this point you should be seriously concerned. You can only carry on working to a limited extent and you may experience symptoms during everyday activities such as cleaning your teeth, combing your hair, opening bottles or riding your bike. 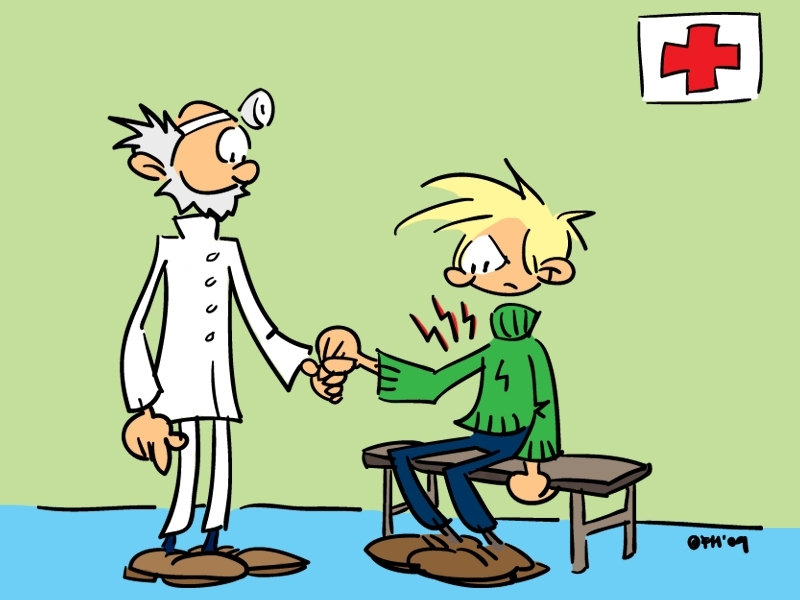 Consult the occupational physician! The persistent phase is chronic. You have severe complaints and serious limitations in both your work and daily life. As nerve damage occurs then even light tasks such as lifting up a glass of water can become impossible. A small number of employees eventually end up in this persistent phase. The symptoms are chronic. Then you can no longer work properly with your laptop or computer. This can have annoying consequences for your work. In this phase you need help from a rehabilitation physician who teaches you how to deal with pain and other symptoms. This can lead to a reduction in your symptoms but that might take a considerably long time. tingling sensations with a paralysing feeling.